Panasonic joins the long list of notebook manufacturers getting into the tablet game. The company announced it would release its Toughbook Android tablet later this year. What's interesting about Panasonic's offering is that it comes from the Panasonic Solutions Company, a division that focuses on government and enterprise technology. Panasonic bills the tablet as "enterprise-grade Android" and plans for a fourth-quarter release. The announcement was light on what, specifically, Panasonic would bring to the enterprise side, but it did note that the Toughbook Tablet would be a "purpose-built business solution" with an emphasis on security and durability. The company also talked directly to the tablet addressing the needs of goverment, field forces, and small and medium businesses. Also notably absent: Details on any hardware specs. Panasonic made no mention of operating system, CPU, memory, or storage configurations. What the company did say was that the tablet will have a 10.1-inch XGA multi-touch matte display with an active stylus pen; GPS; and 3G/4G connectivity. Security will be embedded at the hardware level, presumably akin to the level of security found on self-encrypted hard drives and flash drives today. It will be interesting to see what Panasonic delivers. 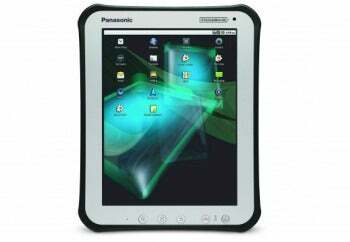 The company is no stranger to the tablet market, having come up with ruggedized tablet PCs in the past. But those tablets ran Windows, and were targeted at vertical markets. I continually hear of a need for tablets that are appropriate for the enterprise market, but I've yet to see much that tablets from disruptive diversion to deployable tool. Emphasis on the yet.